A favourite meal with garden birds all year round! Add the mealworms to the hot tallow, then add blueberries and creamy peanut butter and mix thoroughly. Spoon it into a form to cool. If your tallow does not set up solid, put it into a container and freeze it. Other ingredients that can be added include seed, cracked corn, corn meal, cut up dates or prunes, ground dry dog or cat food, crushed egg shells, mixed fruit, orange squares, chopped or ground nuts such as peanuts, and raisins. 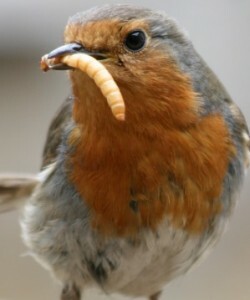 Place the hardened mixture on your bird table or feeder and then wait by the window. Soon your garden birds will drop in to feed on this wonderful feast!